Now, I wish I could say that I made this dress, but no, my very talented Mom did. Thanks again Mom it was a hit. It is the perfect Easter Dress and I just love me some Peter Pan collars!!! It has some tulle in the skirt so it was poofy (love it) and my daughter loved to twirl with it. I did make the bow for her hair though, if that counts. Oh isn't she sweet. Love the dress. Oh what a little sweatheart, and it is a twirly dress!! I should comment on the dress, but instead I want to say how much I love the second photo. Great lighting, wonderful color and the perfect action shot. One of the best photos I've seen on a blog in a long time! The dress, girl and bow are adorable. And the bow definately counts! Darci, what a pretty lil girl you have. I love her dress, and bow. ha! great pics! how can you not love that dress! 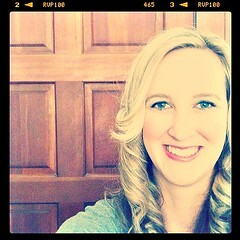 cutie patootie for sure! Perfection! Love the dress! She looks absolutely adorable. Cute! My mom loves her some Peter Pan collars too, everything she sends has one! That's how I keep track of what she's given me for my daughter. 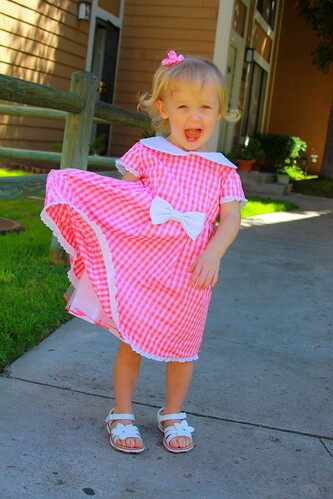 I have blogged some dresses my mom has made my daughter too! It's so cute ... I'm so glad you went with this one. :) Great pictures too!